CONTACT. 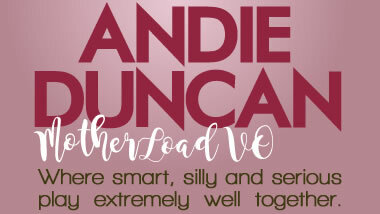 ANDIE DUNCAN. MOTHERLOAD VO. In order for us to play extremely well together, please give us your project’s motherload in the message section, including the style or tone of the piece, a rough idea of its length, where it’s headed (ie: web, radio, television), and a contact number so we can reach you by phone. If you’d like to speak to Andie directly, feel free to call at the number below. Thanks so much for giving us the chance to quote on your project. Let’s play!